It's finally done. Jaitley has dealt his cards. Did he deal you a bad hand, or a good one? The markets reacted strongly with a near 500-point gain for the Sensex yesterday. But how should smart investors react to this budget? I gave you the key highlights from the budget yesterday. And as the dust settles and we take a closer look at it, one conclusion is unavoidable: Despite all of the speculation, hype, and hoopla in the days leading up to the budget, there's nothing really earth-shattering about it. It's just business as usual on most counts. I find the approach our service Microcap Millionaires (MCM) is taking in dealing with the budget very illuminating. It cuts the budget down to size and sees it for what it really is: a routine and mundane government exercise. Yet, the kind of attention this exercise gets here in India, especially in stock market circles, it is only to be expected that the markets react strongly. But from personal experience, I can tell you this: For many on D Street, it has become an outright excuse for speculation. The surrounding hoopla makes it difficult for investors to see through it. And easy to believe that they must 'do' something in response to it. It is at times like these that it is most important to rise above the noise. Make no mistake, it is an important exercise and does affect some businesses more than others. But these differences in most cases are marginal and incremental. And seldom of the 'make or break' variety. All put together, the annual budget exercise is very much a part of the 'normal' business landscape of companies. The multitude of tweaks made in it either help or harm the cause of a given company ever so slightly. But then again, that's true for all the incessant developments, both global and domestic, throughout the rest of the year. Thankfully, the MCM strategy has safety features in place that are built to flourish despite these developments, not due to them. Its collective approach to stock picking, its devotion to large safety margins in the purchase prices, and its dynamic debt component (fixed deposits/bonds) renders most developments that the economy throws at the business world, government budgets included, trivial. We like to think of our MCM strategy as a sort of 'Chinese Wall' between the rough and tumble of the business world and our subscribers' returns. It ensures that over the longer term, our returns remain not just protected, but well ahead of the general market's returns. And Jaitley's budget does nothing to change this equation. But hold the potential to become the blue chips of tomorrow. Now, finding such companies is not an easy task. The Union Budget for 2017-18 was presented by finance minister, Mr Arun Jaitley yesterday. The markets seem to give a thumbs up to the budget, the Sensex closed up 486 points for the day. Does the budget play a crucial role for a serious long term investor? 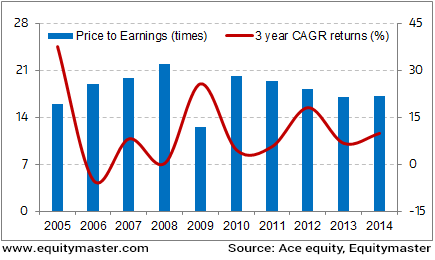 What role if any do the valuations play in prospective returns. We looked at the price to earnings ratio of the Sensex on the budget day as a proxy for valuations and noted the following 3 year compounded annual return going forward. We found that the market returns are agnostic to the budget in the long run. What mattered more was the valuations at that point in time. Cheap valuations are a big driver of future returns. Be it the Union Budget, GST or a great monsoon, you always got to ask the all-important question: Everything said and done, am I paying too much for the stock in relation to its intrinsic value? For even though the budget may be path breaking and the economy may have some great years ahead of it, when you pay too much, even a good stock can quickly turn into a bad investment. Today, we are doing something we don't do often. We are sharing an insightful article my colleague Ankit wrote exclusively for our paid readers. It makes a great connection between investing and the traditional sport of Jallikattu. Jallikattu. There has been a big controversy around this traditional bull-taming sport from Tamil Nadu. I'm going to steer clear of its political and legal aspects. That's not my beat. I was just curious to know about jallikattu. And when I read about it, I found compelling parallels between this ancient tradition and what Rahul Shah has been up to the past eighteen months. This over 2,500 years-old tradition involves releasing a Bos indicus bull into an open area where participants try to grab and hold the bull's hump until it comes to a stop. In some cases, participants must ride long enough to remove the token cloth tied in the bull's horns and collect it as a prize. I'm sure you see this is no sport for the fragile or fainthearted. You're not trying to condition a dull, stationary, predictable bull. And you're competing with hundreds of other participants. Everything happens very fast. Most participants hit the dirt. Some get injured. It is only the best of the best players who are able to grasp the bull's hump, ride it, tame it, and win a prize. The question is: How do you grab, ride, and tame a raging bull? Think about it. You can't approach the bull from the front. It will toss you with its horns. And if you attempt to grab it from behind, you'll surely get kicked. That leaves you with one option - approach it from the side and grab the hump. But that requires both skill and strategy. You have to be agile and fast. And most importantly, you need an intelligent strategy to outsmart the bull. If you have been with us for long, you know that we have played the gentleman's game of value investing...and we have a solid track record of success there. Value investing is like looking for agile, stud bulls that are suffering from a temporary sickness or injury. It's the safest approach to taming the bulls. You grab them when nobody else is willing to run after them. Then you just wait patiently till they rage back to full health. But you pay a price for this gentlemanly approach to investing. You have to patiently wait for the bulls to come to you. And you have to let go of many fast, raging bulls. What's the best strategy to win the stock market jallikattu? How do you grab onto those raging, winner bulls without jeopardising yourself? That's the question Rahul Shah and his team have been tinkering with for months. If you know Rahul, he's no madcap adventurer who would go for the bull's horns from the front. He's the brain behind some of our most stringent investment filters and processes. Rahul believes in identifying the right approach, formulating a solid, profitable strategy, putting it through rigorous tests, and then...just to be extra safe and sure...adding multiple safety mechanisms. For more than eighteen months, Rahul and his team have been building this immensely powerful system to win the stock market jallikattu. This strategy outperformed the benchmark index by a factor of 5:1, point to point. That too, without using leverage or derivatives of any kind. Now, this is the first time we're opening Profit Velocity to members. For more than eighteen months, a team of analysts under Rahul Shah's leadership have put in a lot of effort to make Profit Velocity a reality. That's why we want as many people as possible to sign up and benefit from Profit Velocity right from day one. In keeping with that, our Founder Member opportunity, which closes shortly, offers a 60% savings on the usual membership fees for Profit Velocity. I am told that there is almost no chance we will extend such an opportunity ever again. Now here's something critical...Rahul tells me that the earliest group of subscribers could benefit the most. That's why I strongly recommend you don't miss the first issue of Profit Velocity on 10 February 2017! After opening the day on a flattish note, the Indian stock markets fell below the dotted line. At the time of writing the BSE-Sensex was trading lower by about 42 points (down 0.2%), while the NSE Nifty was trading lower by 15 points (down 0.2%). Sectoral indices are trading on a mixed note with stocks in the metal sector and auto sector witnessing maximum selling pressure. This edition of The 5 Minute WrapUp is authored by Rahul Shah (Research Analyst) and Rohan Pinto (Research Analyst). Is Integration of State Run Oil Companies a Good Idea? The implication of creating an 'oil major' on the energy sector and investors. Equitymaster requests your view! Post a comment on "What to Do After Budget 2017-18". Click here! Except for ONGC, Equitymaster has no financial interest in any other Subject Company forming a part of this report.